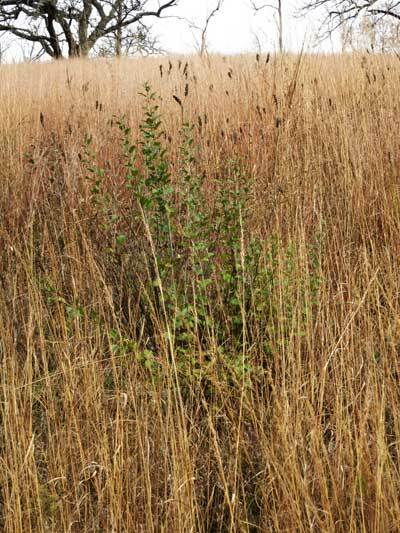 October is a great time to basal bark buckthorn in prairie and savanna remnants! 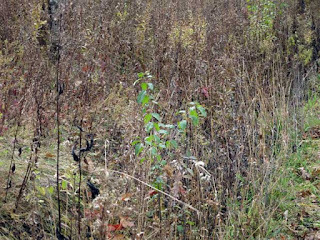 Even a single stem of buckthorn stands out among all the brown senesced native species. If it's green this time of year, it's probably bad. It may be too late for a foliar spray, but basal bark with triclopyr works all year long. Use 20% Garlon 4 in bark oil (20 parts Garlon 4 plus 80 parts bark oil). If you don't have bark oil, use diesel. 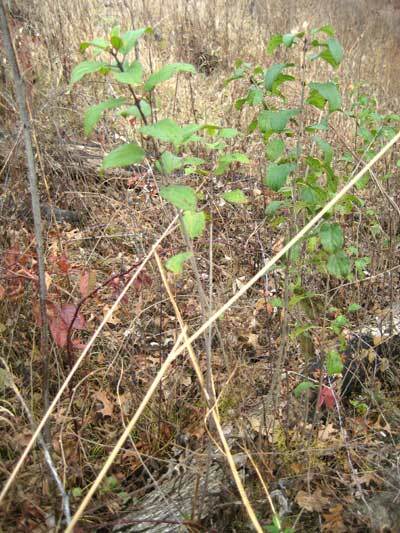 Even a natural area where buckthorn has been eradicated will always have a few new shoots. If they are not treated NOW, they will be bigger next year! We always budget time in the fall for control of invasive shrubs. Not only buckthorn, but also honeysuckle, sumac, and brambles, all of which are easy to spot. 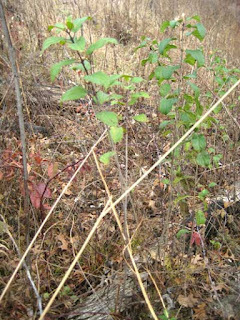 In a tour of known buckthorn areas at Pleasant Valley Conservancy yesterday, we found only two stems. It took less than a minute to basal bark each one. How viable are our hand-collected seeds? Kathie and I often discussed the quality of our collected seeds. Would they grow when planted? Would the seeds germinate? 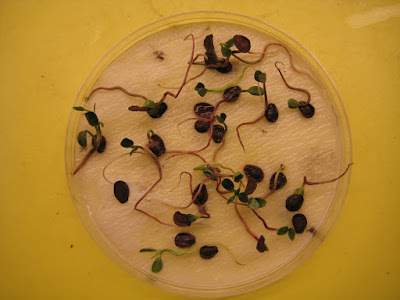 Seed germination tests are not that hard to do and in early January 2008 I set up number of tests. 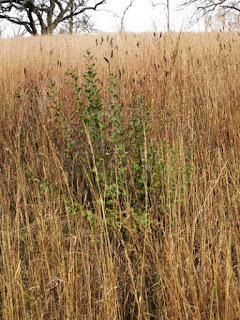 Most prairie and savanna species need a period of cold moist conditions to overcome dormancy. I used conventional petri plates with warm absorbent paper (filter paper) in the bottom. 25 seeds were placed in each plate, which was wrapped in Saran and placed in the back of the refrigerator. In early January 2008 the plates were placed under lights (16 hours light; 8 hours dark), rewatered when necessary, and observed daily for germination. As the table shows, the milkweeds germinated very well, as did the grasses, but some of the other forbs germinated poorly or not at all. We confirmed some of these data with greenhouse studies in future years. Obviously, if the seeds do not germinate, the chance of getting plants from planted seeds is not good. However, with most species we generally plant a lot of seed, so if the % germination is only 1-2%, there is still chance of getting some plants started from seed. The best approach for those poor germinators was to use the greenhouse. We planted large amounts of seeds in flats and put them under lights after cold, moist stratification. We transferred the few plants we got to tubes and raised plugs. Most of the plugs we transplanted to the field grew, and became established. This worked especially well for E. sessilifolium, one of the state-listed species. 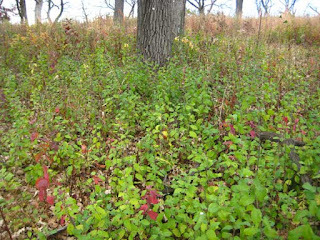 Of course, every year will be different, depending on conditions at the time seed formation is taking place.